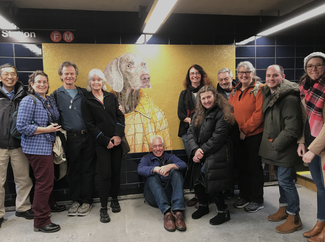 I've taken thousands of photographs of these amazing works and lead many artists, students and enthusiasts through the vast NYC transportation network to view these underappreciated works of art. As a professional mosaic artists, I will be explaining the process of how the mosaics were designed, fabricated and installed, giving fellow mosaic artists insight into the complex process of creating a smalti mosaic. The cost for my tour is $75 per person. There is a minimum of 8 people to hold the tour, and a maximum of 16, so sign up today and join me for a private and technical look at these masterpieces! There will be a one hour lunch break, but you may also want to bring a snack. There will be NO REFUNDS for Cancellations after April 1st. Any cancelations prior to that date will receive a refund minus any Paypal and Sign-up Genius fees.